Successfully Added GSM Quad Band Dual SIM Multimedia Cell Phone w/ Multi-Color LED to your Shopping Cart. GSM quad band dual SIM multimedia cell phone with multi-color LED for call alert. This unlocked all-in-one GSM dual SIM card media mobile phone with 2.7 inch touchscreen display is a good choice for people who enjoy media features on their mobile phone. Have two active phone numbers with your new multimedia mobile phone and stay connected wherever you are in the world. This model is great if you travel frequently and is filled with media features to keep you entertained during your travels. With so many mobile phones out there today, it is difficult to choose the right one. This mobile phones best feature is its performance, with a very simple navigation system and good touch screen performance, you don't have to STAB your stylus pen to the screen to get it to work. Making it good for anyone who doesn't want to spend all day trying to get their new cellphone to simply make a call! With tons of functions and features too numerous to name, this stylish mobile phone does everything you could want from a simple phone call to watching TV. In addition, there are built in daily software tools normally found in PDA's, such as advanced organizer, alarm and to do lists that make your hectic life just that much easier to deal with. Wow, the back cover is hard to remove, what is up with that? The battery cover is meant to be tight in order to protect the battery from adverse weather conditions. The phone's back cover is designed to be tight, this is a value-added feature of this model phone. I live in the USA, will this Dual SIM mobile phone work here? 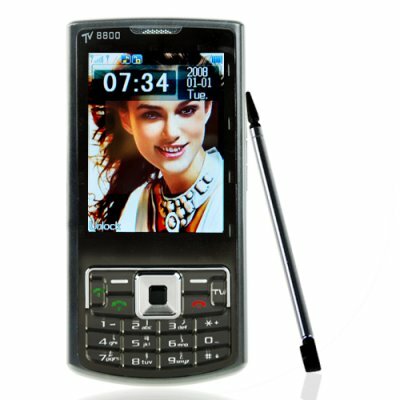 Yes, this Quad band GSM mobile phone will work anywhere in the world. The LED flashing lights only seem to work with alerts on SIM 1 and not SIM 2, is something wrong with my phone? No. The LED's light up with all media but with alerts they only work with SIM 1. Excellent item as described , pitch Shift application is fun and overall was a good choice. Excellent phone...It's got also webcam for computers!!! really good stuff... I recommend it! !